Hiero!! You had ample opportunity there to see how much I sucked! I was basically powerless against any person regardless of their weapon. I got sloshed, splatted, inked, rolled, swiped, the full shebang. Variety is the best thing about Salmon Run! You never know where the next deposition point is going to be, you never know when the tide will be high or when it gets dark and the game is more about survival than collecting. It gets pretty terrifiying when you're confined to the ship part of that one map, and it's foggy and suddenly Steel Eel comes to murder you with its endless paint-raining body. The Grillers in Salmon Run are super tough, I've probably only survived about 1 in 3 rounds where they've shown up. Does anyone have any good strategies on how to deal with them? I've got into a groove with the Aerospray MG. The super for that weapon is so strong in quickly covering an area with loads of ink. The grillers always go for a specific person, and their weakspot is behind them. You need to maneuver so that the person being followed ends up on the opposite side to the other 3 who are focus-firing on it. Gotta still be quick because that person being chased is going to run out of room quickly. ...Of course Thumbs would have a page on Splatoon 2 why didn't I think of this. Right now I'm focused on gaining levels and upgrading my gear, though I've yet to understand the right path for it. Like, what's the optimum thing to do: unlock all the additional stats on gear and then scrubbing them to collect ability chunks? Do I invest in food and drinks from Crusty Sean (and I'm Sean Vanaman) for exp boosts or stat increase? Each piece of gear has one main ability, 1-3 sub-ability slots, and a brand. The main ability can (almost) never be changed. The brand can absolutely never change. The sub-abilities fill in as you the level the gear. A gear's brand influences your likeliness to roll specific abilities in your sub slots; each brand has 1 ability it's 5x more likely to roll, and another it's half as likely to roll. Special gear (like from the story mode or amiibos) are equally likely to roll anything. Gear can be bought in the in-game store, the Splatnet online store (more on this later), or ordered from the inklings walking around your plaza (ex, if you like someone's hat you can buy a copy of it for an upcharge). Crusty Sean sells drinks that temporarily improve your likeliness of rolling specific sub-abilities, as well. These can only be bought using specific tickets that you randomly get from Salmon Run rewards. A main ability is a little more than 3x as effective as a sub ability of the same type. Abilities of the same type have diminishing returns (we're still working on the math). If you go to the ability status pane of the menu, you can see all the abilities in the game. Each ability that doesn't have a # of chunks beside it (the bottom 12) are special. These can only be main abilities, never rolled as subs, and are exclusive to different categories of gear. Opening Gambit, Last-Ditch Effort, Tenacity, and Comeback are exclusive to Hats. Ninja Squid, Haunt, Thermal Ink, and Respawn Punisher are exclusive to Clothes (Ability Doubler currently doesn't exist in the game ircc). Stealth Jump, Object Shredder, and Drop Roller are exclusive to Shoes. Abilities, generally speaking, have very minimal effects. Stat information is still coming in, but expect most abilities to be almost unnoticeable during play. This guy's channel has plenty of comparison videos from the first game, and things don't look drastically different so far. If you're looking to optimize your gear, there are two currencies you need to care about: ability chunks and super sea snails. Snails are used to increase the number of sub-ability slots on 1-2 star gear, and to reroll all three sub ability slots on a fully leveled piece of gear (like a slot machine). You also get one ability chunks for each sub-ability you replace. Unlike the last game, it looks like there's no way to purchase snails with money, meaning you can only acquire them through splatfest rewards and leveling up (you get one at 30, and one more each level after that). Given their new scarcity, I'd advise you only use snails to add ability slots to gear since there are certain combinations of abilities and brands that only naturally exist on 1 and 2 slot gear. Ability Chunks are used to put the ability of your choosing into an empty sub ability slot. It normally takes 10 chunks per slot, but gets more expensive when applying identical sub abilities to the same piece of gear (ex, the 1st run speed up sub costs 10 chunks, the 2nd 20, and the 3rd 30, so it would cost 60 chunks to give a piece of gear 3 identical subs). You get chunks through scrubbing gear, rerolling gear, and replacing gear. Scrubbing empties a gear's sub slots, gives you one chunk for each ability removed, and costs $20,000. Unfortunately, it looks like you can't scrub specific slots; you have to remove them all. If you would ever receive a piece of gear you already have (say, through ordering something, or getting another copy of this month's Salmon Run shirt) you have the option to keep your existing gear or keep the new gear and turn all of the old gear's sub-abilities into chunks. So what's should you actually be doing? First, wait until all the statistics come in and 'the meta' coheres. We honestly don't know which abilities are good for what yet, even if we have suspicions (ex, ink resistance is great for mid-close range weapons, Quick Respawn is terrible). It takes so long to make perfect gear that you don't want to waste any resources. When you start grinding, your goal will almost always be to give your gear 3 identical sub abilities. It'll cost more chunks, but will give you more flexibility to mix-and-match your outfit. Pick your gear based on its main ability and what sub its brand favors, then max out its sub slots with snails if necessary. This spreadsheet has information on every piece of gear you can buy in the in-game store, and will be invaluable when planning your build. Oddly enough, for the moment it looks like the optimal way to grind ability chunks is through Salmon Run. You get random chunk rewards at a far faster rate than fully leveling 3 star gear + paying $20k, even if you're less likely to get the specific chunks you need. Once you get a drink ticket for the ability that matches your gear's brand's preference, then you should scrub your slots and start releveling your gear. At that point, you're reasonably likely to just naturally roll 3 of the same sub ability, chunks be damned. 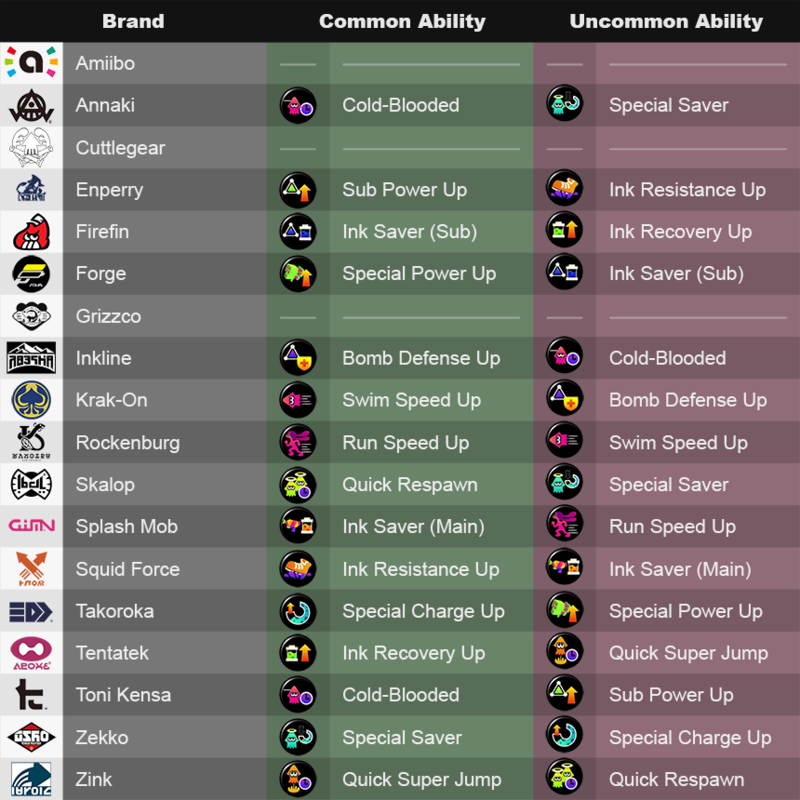 Assuming the ability combinations are in fact random, then any Main+Sub ability combination in any gear slot becomes realistically possible, if very rare. Getting this variant gear replaces the non-variant version. Ex, you buy a pair of Blueberry Casuals online with Special Saver as its main ability. Normally, those shoes would have Ink Saver (Sub). Now, if those shoes show up in the in-game shop, you can't 're-buy' them to get the normal version back. You're stuck with Special Saver unless you manage to find someone wearing the normal pair in your plaza. This means you can accidentally screw yourself out of good gear by buying worse variants of it in the online shop. If you're going to buy anything from the Switch app, check that spreadsheet I linked above and compare it to its normal version. Do you like that ability better? Are there other pieces of gear with the same main+brand combination? Etc. Just to clear something up: the app isn't terrible. It being the only way to use voice chat is terrible. Unrelated: man it is enjoyable to splat roller people unawares, when you circle around them, scoop up any ink they're laying down and then isolate them on a shrinking island of turf. Am I correct in assuming that the effects are minor enough that I can ignore them and wear the gear I think looks the coolest and be basically fine? Cool, I'm not very good at this game anyway so I'll just keep being fly. Through a combination of luck and tenacity (alright, just playing enough of the game), I reached level 10 and was allowed into the hallowed sanctity of Ranked Battle. Which, along with League Battle, features wholly new modes different from Turf War. Now, I am vastly outgunned and outskilled in this mode, losing 90% of my battles there, but boy is it exciting. It made me appreciate how much variety and freedom there is in Turf War, where you basically get to decide your own play style (offensive, sneaky, more focused on splatting enemies or inking ground). In Ranked Matches, there is a singular objective and nothing else matters. So usually there's a mad dash by both teams for the objective and it offers some of the fiercest fights ever. My first matches were Tower Control, and it took awhile before I figured that out. Yesterday I played Splat Zones. In both cases there's a heavily contested, small area in the map that becomes home to insanity, sniping, pushes and grenades. I aim to eke out some skill in this over time, but so far it's enough that it gets my blood pumping. It's very intense. Going back to Turf War afterwards feels like a relaxed holiday. It made me appreciate how much variety and freedom there is in Turf War, where you basically get to decide your own play style (offensive, sneaky, more focused on splatting enemies or inking ground). In Ranked Matches, there is a singular objective and nothing else matters. I kinda feel the opposite of this. Whenever I play turf war I feel like I'm wasting time if I'm not inking ground, and so many of the weapons don't spread ink very quickly. If you want to use a weapon that's tuned for splatting like a blaster or charger it feels like you have to be really good at it or you just drag the team down. In ranked the objective takes up less of the map, but I feel like I can use whatever weapon and even if I'm not doing that well I can do something with it that visible helps the team. Whenever I play turf war I feel like I'm wasting time if I'm not inking ground, and so many of the weapons don't spread ink very quickly. You goal in Turf War is not to ink ground as fast as you can, it's to ink a higher percentage of the ground than your opponent. That's an important difference. Dead enemies aren't spreading ink, so killing players is a means to acquiring a turf advantage. There's always a little bit of rock/paper/scissors going on with weapon selection, since things that just outrange the tier below them can usually get kills quite easily. A mediocre Splattershot Pro player can eat up a good Aerospray player. Likewise, Chargers and Splatlings can act as area denial, preventing players from inking territory within their kill radius, thereby holding turf. There was a time in early Splatoon 1 where people hadn't internalized this difference yet; a disproportionate number of people used Aerosprays and would actively avoid fighting each other, instead just sneaking elsewhere to paint. People would literally paint circles around each other and get 3,000+ pts in a round. Then people slowly realized that if you used a Roller or a Squelcher you could easily outzone those aerosprays and never give them the opportunity to paint at all. The thing is, I feel like a lot of this is only relevant if you're better at the game than I am. I understand the theoretical advantage of using a charger, but if you aren't good at reliably splatting people with it, it does very little because that's all it's good for. If you're bad at reliably splatting people with the splattershot it's fine because you're only trying to do that when you have a good opportunity and you can do other stuff the rest of the time. The reason I don't feel that way in ranked is because if I'm bad at platting people with the blaster there's less of an opportunity cost, and I'd be doing just as bad with any other weapon anyway. I don't think you're giving yourself enough credit. Chargers are the most extreme example, and I agree; if you can't aim, don't use a weapon that requires good aim. But there's a whole spectrum of play styles between "kill everyone you see" and "paint everything always". That spectrum is where the strategic variety Roderick was talking about exists. If you want to be more aggressive but you're worried about your aim, Sloshers and Brushes are a great crutch for that (and they're not bad painters either). IMO, just try something goofy and notice how much Turf War rewards you it. Grab the Splat Roller, wear a shirt with Ninja Squid, and pretend to be Jaws for a round. They just added a crazy umbrella thing and I'm curious to try it out. Also, the new Splatoon amiibo are GORGEOUS in real life, perhaps the best looking and best made amiibo yet. Nintendo, get going on that Pearl & Marina set! The umbrella is fun, but it does feel very situational. I love the concept, but in practice, i found that popping the brolly up kinda leaves you super defenseless with any weapon that isn't a charger, as you just can't retaliate fast enough, but it does do a fair amount of damage. the brolly is in the single player, if you want to play about with it. I really hate rainmaker. It's a great idea, but there are so many people who don't know what they're doing, even at C+ rank. I can't wait to get up a tier, because i'm getting fed up with people on our team taking the damn thing closer to our base and then dying. I had one guy last game who just swam around with the rainmaker, not knowing where to go or what to do, and had it in one corner of the map until the timer wore down and it got reset to the center. I didn't even know it did that! And then we lost. Saying that, I did get a real rush when i grabbed the rainmaker 10 points away from our base and sped it all the way to theirs. That was awesome. The Splatoon amiibo are always super gorgeous, but yeah, they really outshone themselves with them this time around! from the detailing on the boy squids hands, to the difference in plastic textures between the ink and squid in the squid form amiibo, it's really something! Also, their clothing sets are awesome. I love the school shoes with the socks. Dey look so hip. We piggybacked off the local Smash community again for this, so it was pretty cramped for space, but we'll probably do it again next time; I think most people had a good experience.